, a statesman and poet, the only son and heir of sir Henry Wyat of Allington-castle, in Kent, was born in 1503. His mother was the daughter of John Skinner, of the county of Surrey. His father was imprisoned in the Tower in the reign of Richard III. when he is said to have been preserved by a cat which fed him while in that place, for which reason he was always pictured with acat in hisarms, or beside him. On the accession of Henry VIL be had great marks of favour shewn him, among which w0,s the honour of knighthood, and a seat in the privy-council. One of the last services in which he was employed by that king, was conducting to the Tower the unfortunate earl of Suffolk, who was afterwards beheaded by Henry VIII. He was also a member of Henry VIII.‘s privy-council, master of the jewel-office, and of the vanguard of the army, commanded by the king in person, which fought the memorable battle of the Spurs. He died in 1533. The honours of educating sir Thomas has been claimed for both universities; by Carter for St. John’s college, Cambridge, and by Anthony Wood for Oxford, because he resided for sometime on the establishment of cardinal Wolsey’s new college, now Christ-church. He then set out on his travels according to the custom of that age, and returned after some years, a gentleman of high | accomplishments and elegant manners, and of such conversation talents both as to sense and wit as to have attracted the admiration of all ranks, and particularly of his sovereign, who bestowed on him the order of knighthood, and employed him in various embassies. 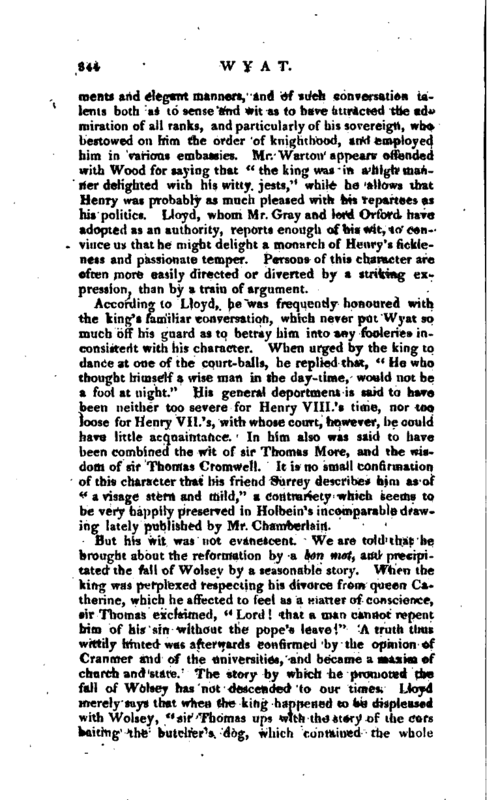 Mr. Warton appears offended with Wood for saying that “the king was in a high manner delighted with his witty jests,” while he allows that Henry was probably as much pleased with his repartees as his politics. Lloyd, whom Mr. Gray and lord Orford have adopted as an authority, reports enough of his wit, to convince us that he might delight a monarch of Henry’s fickleness and passionate temper. Persons of this character are often more easily directed or diverted by a striking expression, than by a train of argument. According to Lloyd, he was frequently honoured with the king’s familiar conversation, which never put Wyat so much off his guard as to betray him into any fooleries inconsistent with his character. When urged by the king to dance at one of the court-balls, he replied that, “He who thought himself a wise man in the day-time, would not be a fool at night.” His general deportment is said to have been neither too severe for Henry VIII.‘s time, nor too loose for Henry VII.’s, with whose court, however, he could have little acquaintance. In him also was said to have been combined the wit of sir Thomas More, and the wisdom of sir Thomas Cromwell. It is no small confirmation of this character that his friend Surrey describes him as of “a visage stern and mild,” a contrariety which seems to be very happily preserved in Holbein’s incomparable drawing lately published by Mr. Chamberlain. But his wit was not evanescent. We are told that he brought about the reformation by a bon mot, and precipitated the fall of Wolsey by a seasonable story. When the king was perplexed respecting his divorce from queen Catherine, which he affected to feel as a matter of conscience, sir Thomas exclaimed, Lord! that a man cannot repent him of his sin without the pope’s leave!“A truth thus wittily hinted was afterwards confirmed by the opinion of Cranrner and of the universities, and became a maxim of church and state. The story by which he promoted the fall of Wolsey has not descended to our time*; Lloyd merely says that when the king happened to be displeased with Wolsey,” sir Thomas ups with the story of the curs baiting the butcher’s dog, which contained the whole | method of that great man’s ruin," alluding to the common report of Wolsey’s being the son of a butcher at Ipswich. In the early state of the reformation, the clergy were discontented, because afraid of losing their valuable lands. “Butter the rooks nests,” said sir Thtfmas, “and they will never trouble you.” The meaning, not very obvious, was that the king should give the church lands to the great families, whose interest it would then be to prevent the reestablishment of popery. The wit, however, of this advice is more remarkable than the wisdom, for notwithstanding the robbery of the church, which has hept her poor ever since, popery was effectually re-established in queen Mary’s reign. The liberality of the only other bon ’mot recorded of sir Thomas may be questioned. One day he told the king that he had found out a living of 100l. a year more than enough, and prayed him to bestow it on him, and when the king answered that there was no such in England, sir Thomas mentioned a the provost-ship of Eaton, where a man hath his diet, his lodging, his horsemeat, his servant’s wages, his riding charge, and an hundred pounds per annum besides." 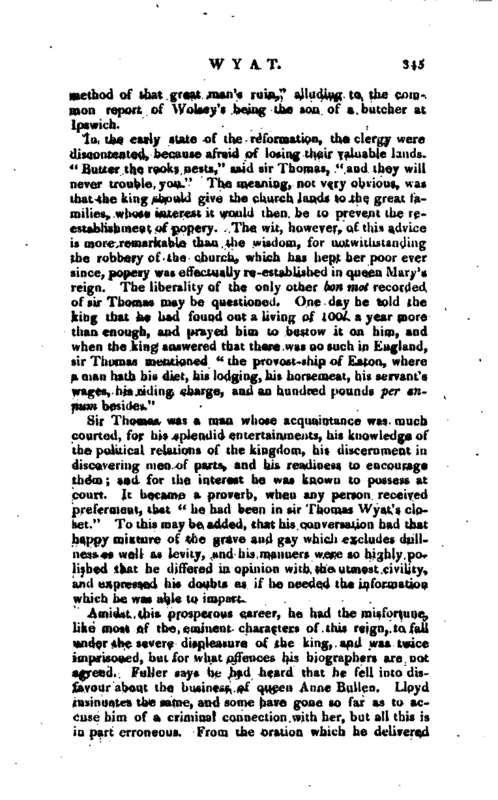 Sir Thomas was a man whose acquaintance was much Courted, for his splendid entertainments, his knowledge of the political relations of the kingdom, his discernment in discovering men of parts, and his readiness to encourage them; and for the interest he was known to possess at court. 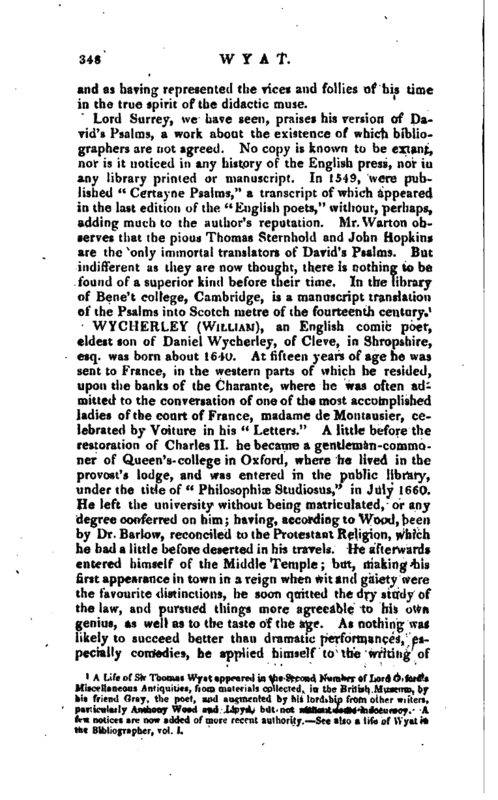 ID became a proverb, when any person received preferment, that “he had been in sir Thomas Wyat’s closet.” To this may be added, thai his conversation had that happy mixture of the grave and gay which excludes dullness as well as levity, and his manners were so highly polished that he differed in opinion with the utmost civility, and expressed his doubts as if he needed the information which he was able to impart. so, he was well served, and he would he were so." Sir Thomas acknowledged the possibility of his having uttered the first part of this sentence, and explained his meaning, viz. that between the emperor and the king of France, his master Henry would probably be left in the lurch. Lord Orford contradicts Anthony Wood’s account of sir Thomas’s death, by playing in his usual way upon English words, but unfortunately upon words which are not to be found in the Almanac. See Misc. Antiquities, p. 18, note, and compare with Wood, vol. I. col. 57. “Drayton, in his verses to master George Sandys, treasurer for the colony in Virginia, mentions the name of a Wyat, who probably might be a descendant of our poet’s, Sandys was related to the Wyat family.” —Headley’s Beauties, I. ixvi. | death for high treason in the reign of queen Mary., His lady, according to Wood, was Elizabeth, daughter of Thomas Brooke, lord Cobham *. 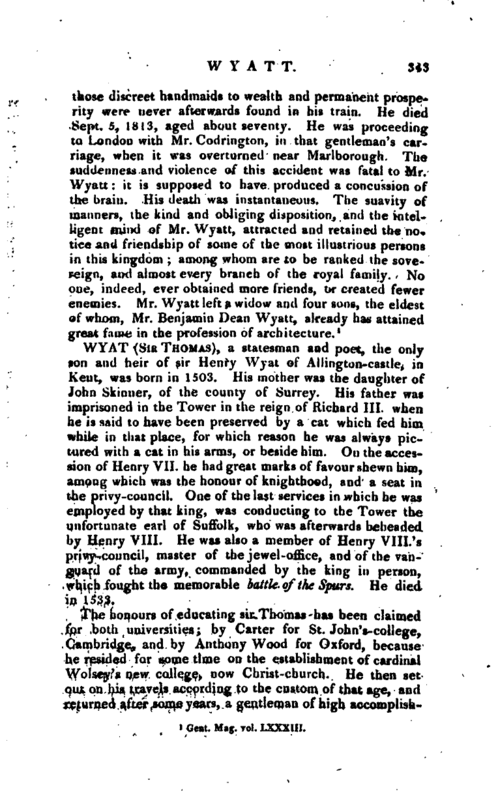 His son left issue, by Jane his wife, daughter and co-heir of William Hawte of Bourne, knight, a son named George Wyat of Boxley in Kent, restored 13 Elizabeth. 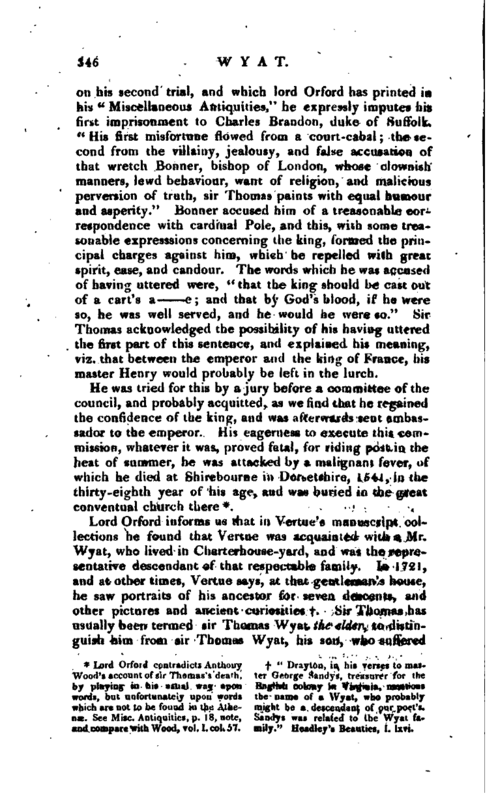 Sir Thomas’s biographers are in general silent on the subject of his connection with lord Surrey. It is known, however, that they were closely allied by friendship, and similarity of taste and studies. Surrey’s character of Wyat is a noble tribute to his memory. The year following his death, Leland published a volume of elegiac verses, some of which are very elegant, and all highly encomiastic, entitled “Naenise in mortem ThomaB Viati, Equitis incomparabilis, Joanne Lelando Antiquario, Auctore,” 4to. This scarce pamphlet has a woodcut of Wyat, supposed to be by Holbein, but represents him as a much older man than he was, and with a huge bushy beard hiding more than half his features. The copy in the British Museum is dated 1552. She afterwards married sir Edward Warner, bart. Hasted’s Kent, vol. II. p. 183. | and as having represented the vices and follies of his time in the true spirit of the didactic muse. 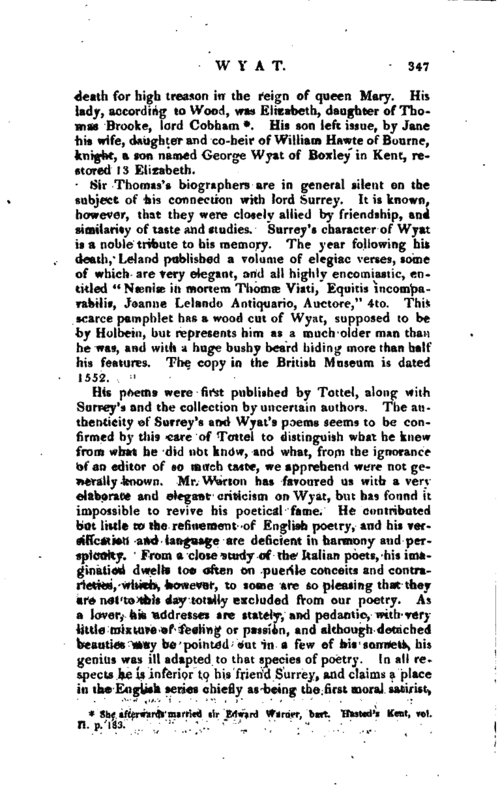 A Life of Sir Thomas Wyat appeared in the Second Number of Lord Orford’s Miscellaneous Antiquities, from materials collected, in the British Museum, by his friend Gray, the poet, and augmented by his lordship from other writers, particularly Anthony Wood and Lloyd, but not without some inaccuracy. A few notices are now added of more recent authority. Sea also a life of Wyat in the Bibliographer, vol. I.